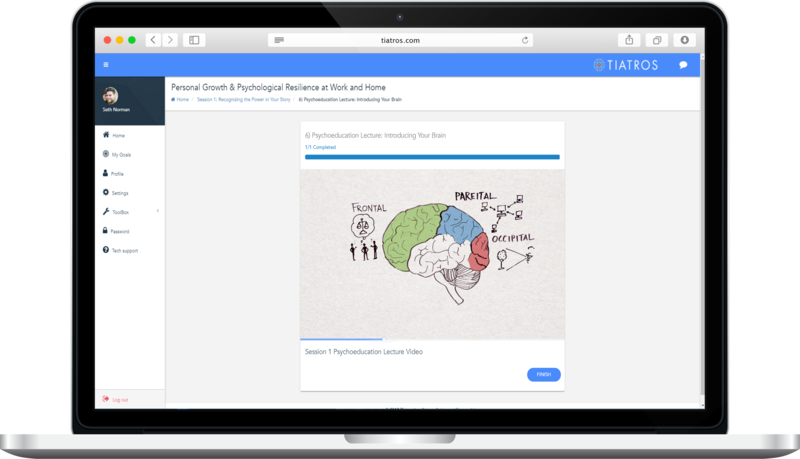 Tiatros is revolutionizing the role of Human Resources, providing the tools that corporate HR and benefit groups need to actively manage the overall mental health, productivity and psychological resilience of their workforces. The Tiatros approach to delivering care is the most efficient way to help those in need and reduce the largest source of unnecessary corporate healthcare spending and productivity waste — an almost $400 billion annual problem. Tiatros programs delivered on our highly secure HIPAA-compliant online platform, improve psychological health and reduce the emotional distress that can cause and exacerbate physical health conditions like chronic gastric irritation, musculoskeletal illnesses, insomnia, pre-diabetes, heart disease, high-risk pregnancy, premature birth and other serious health problems. 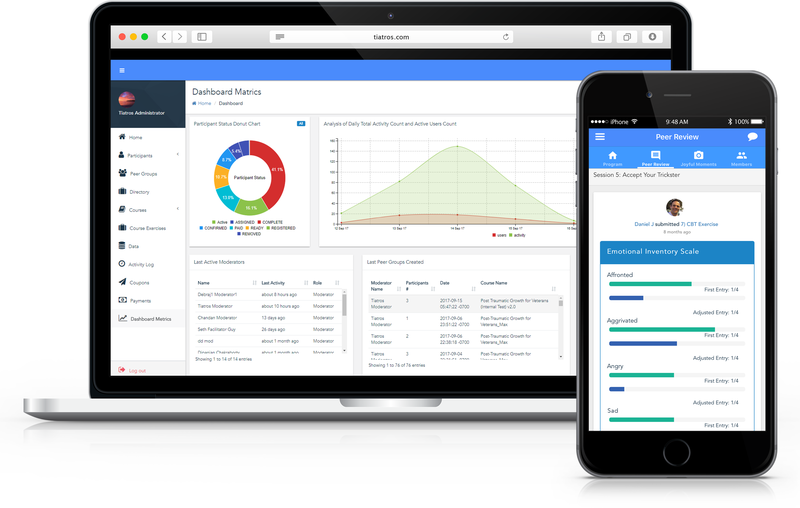 The Tiatros platform can deliver secure, evidence-based behavioral health programs to hundreds of participants, using a single skilled facilitator. 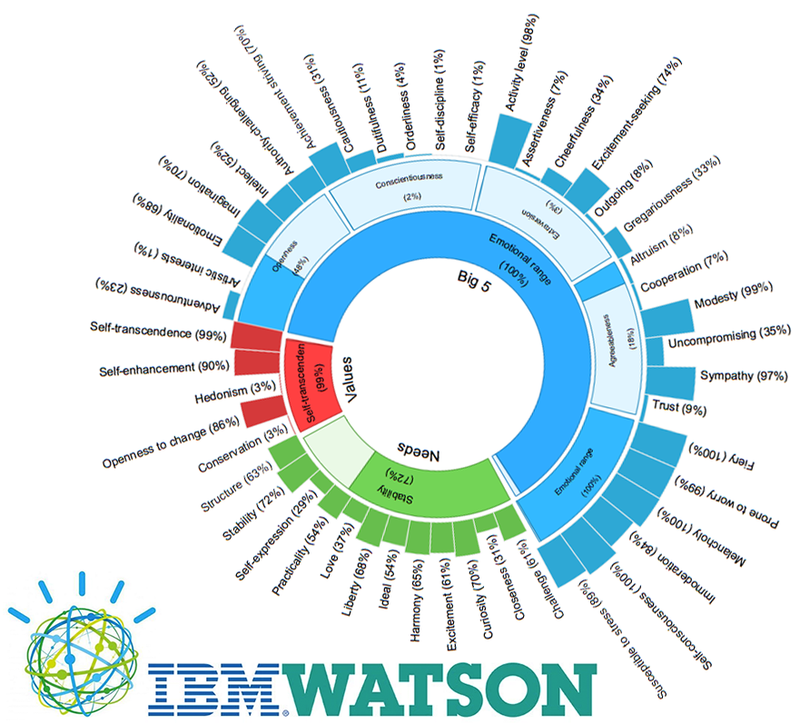 This unique capability enables teams of Tiatros group facilitators to support thousands of employees around the globe with unprecedented results. Our programs are created by expert clinicians and tailored to a variety of topics and demographics. Participants complete clinically validated Cognitive Behavioral Therapy exercises, the most widely used and proven method for treating depression and anxiety. They will also learn new skills from doctors and scientists, and are engaged by animations and storytelling. And because our peer groups work together asynchronously, Tiatros programs provide access to the best of both individual and group psychotherapy methods. Independent evaluations of Tiatros found participants complete their programs at a rate of 70% with increased levels of engagement, this greatly increases the efficacy and is a much higher rate than many other psychotherapeutic interventions. Tiatros delivers the highest quality of personal care not only at a much lower cost but at a scale that is orders of magnitude greater than traditional individual therapeutic interventions. From 1:1 to 100:1. Tiatros participants demonstrate reduced somatization and associated workplace absenteeism, reducing the total cost of care. When scaled this can result in cost reductions nearly 10:1. Reach out to us if you have questions, would like more detailed information, or to schedule an online tour to learn how our programs can strengthen and increase the emotional health of your workforce. 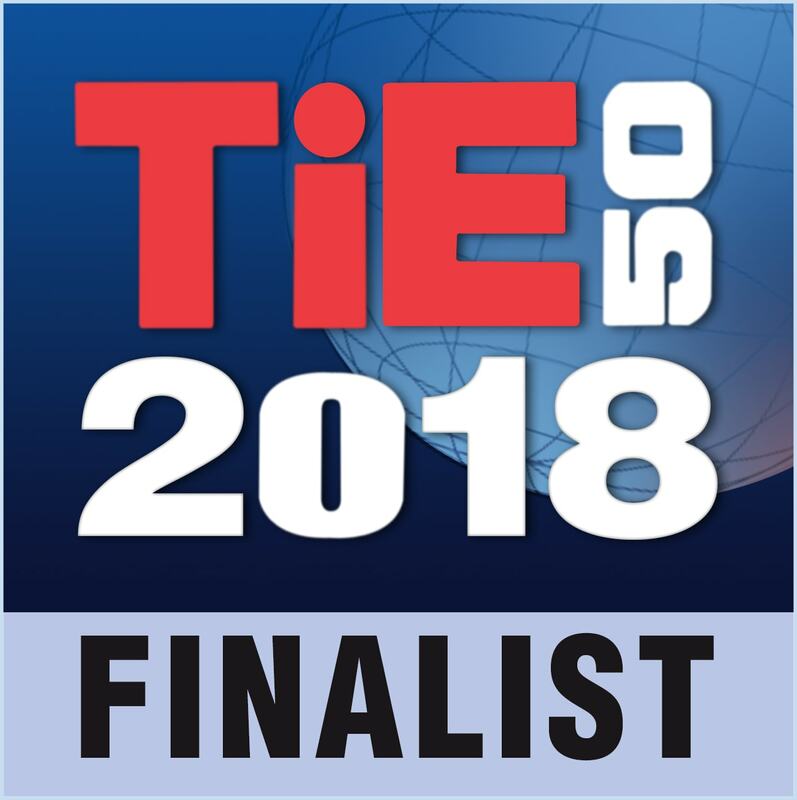 Tiatros Inc. is excited to announce that it has been selected as a "2018 TiE50 Finalist" for the prestigious TiE50 Awards Program recognizing the world's most innovative tech startups. This awards competition is part of TiE Inflect 2018, the world's largest conference for tech entrepreneurs. “The Tiatros team is delighted to be recognized by Tie50 as a thought leader in Digital Therapeutics for Behavioral Health. 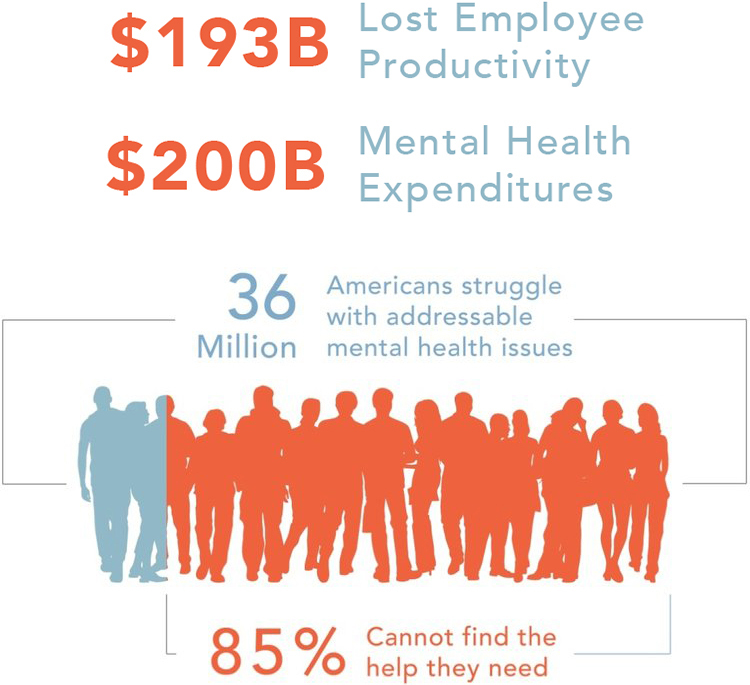 Our role in this space is to offer evidence-based psychotherapeutic and psychological resilience programs and new, data-driven tools that enable the Human Resources and Employee Benefits groups in large self-insured companies to take a far more active role in managing the mental health and resilience of their entire workforce,” states Kimberlie Cerrone, Founder and CEO, Tiatros Inc.
"TiE50 has become a global brand that attracts thousands of tech startups worldwide. This year, we screened more than 7400 companies from 28 countries and selected the best-of-breed as our "2018 TiE50 Finalists." These companies are finalists in the ultimate runoff for the 50 winners. Our program has gained notoriety over the past decade as a competition run with the highest level of integrity and vigorous screening and judging by domain experts,” reports Kamal Anand, TiE50 Program Chair. 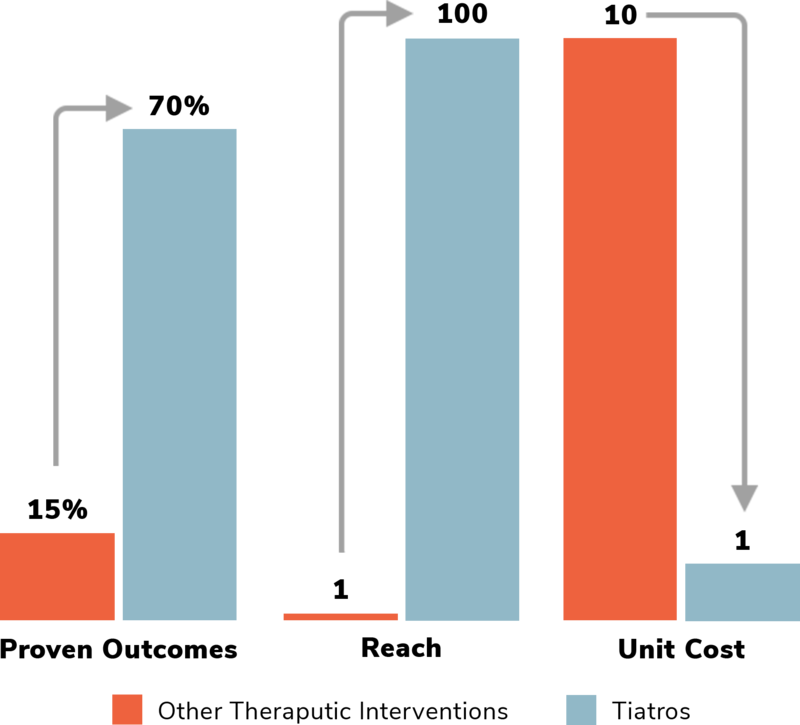 "As a 26-year not-for-profit organization dedicated to fostering entrepreneurship and with a global footprint of half million entrepreneurs, enterprise executives, and investment professionals, we pride in the fact that we are one of very few competitions without any pay-to-play incentives,” states Ram K. Reddy, President, TiE Silicon Valley. TiE Inflect (previously TiEcon) is the world's largest conference for entrepreneurs and intrapreneurs with participation from top technology companies, leading venture capital firms, and global services providers. TiEcon 2017 attracted 5400+ attendees from across the world - including CEOs of established companies to first-time entrepreneurs creating new companies, to leading investment professionals and corporate executives. The conference was listed by Worth Magazine as one of the 10 best conferences for ideas and entrepreneurship along with TED and the World Economic Forum. For more information, please visit http://www.tieinflect.org. The Indus Entrepreneurs (TiE) is a not-for-profit organization founded in 1992 in the Silicon Valley by a group of successful entrepreneurs, corporate executives, and senior professionals. TiE is the world's largest network of tech entrepreneurs. We are a cohesive global network with a footprint of half million entrepreneurs, enterprise executives, investment professionals and other accomplished individuals. We operate from 60 cities in 18 countries. http://www.tieeco.org. 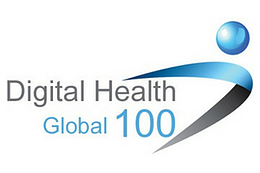 We are delighted to be able to announce our 2017 Global Digital Health 100.The Global Digital Health 100 is one of the HealthTech industries foremost technology awards programmes, celebrating innovation and entrepreneurship. It recognises and supports health technology companies that are demonstrating the greatest potential to change the way that healthcare is delivered. Over the past four years, the Global Digital Health 100 has become established as the international benchmark of innovation in the healthcare technology industry. This year's 100 sees many new entrants from all sides of the HealthTech spectrum, from new innovators looking to apply technologies like blockchain and AI to healthcare, to solution providers who are demonstrating rapid growth in more established tech-led services like teleheath.